Every eCommerce platform Jilt supports is a little different. When using our Transactional Emails feature, it's important to make sure you take the few quick steps to ensure full compatibility with your platform. ℹ️ You need a paid Jilt account to add transactional notifications, and can upgrade your account here. You will need to run version 1.6+ version (released mid-February) of the Jilt for WooCommerce plugin. That's it! When you add a new transactional email, we will automatically disable any corresponding default WooCommerce email it's replacing so you don't double send the same customer notification. There is no need to update Jilt for EDD to use transactional notifications. However there is a preferred action to take on your store settings: EDD requires manually disabling the matching transactional email using a free extension. This will ensure notifications are not duplicated. Once the plugin is active, there are no further steps necessary to disable purchase receipts. A future version of Jilt for EDD will add this as a setting for you, stay tuned! 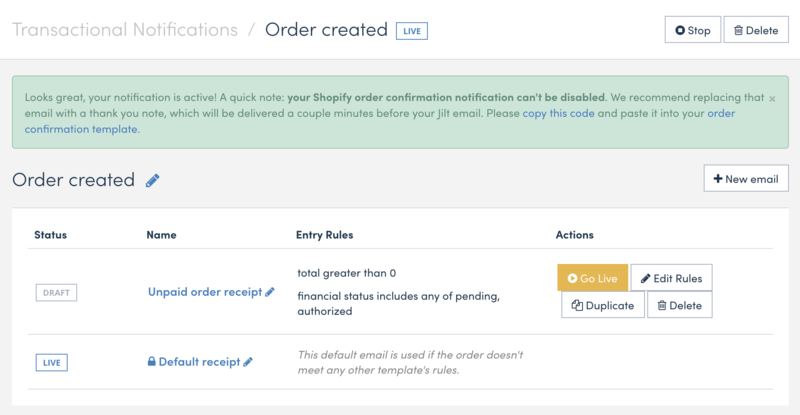 Shopify does not allow users to disable the built-in order receipt email, so we advise you to adjust the standard Shopify order confirmation email text to include the minimum information necessary, such as, "your order is received, we'll be sending along more information soon!" 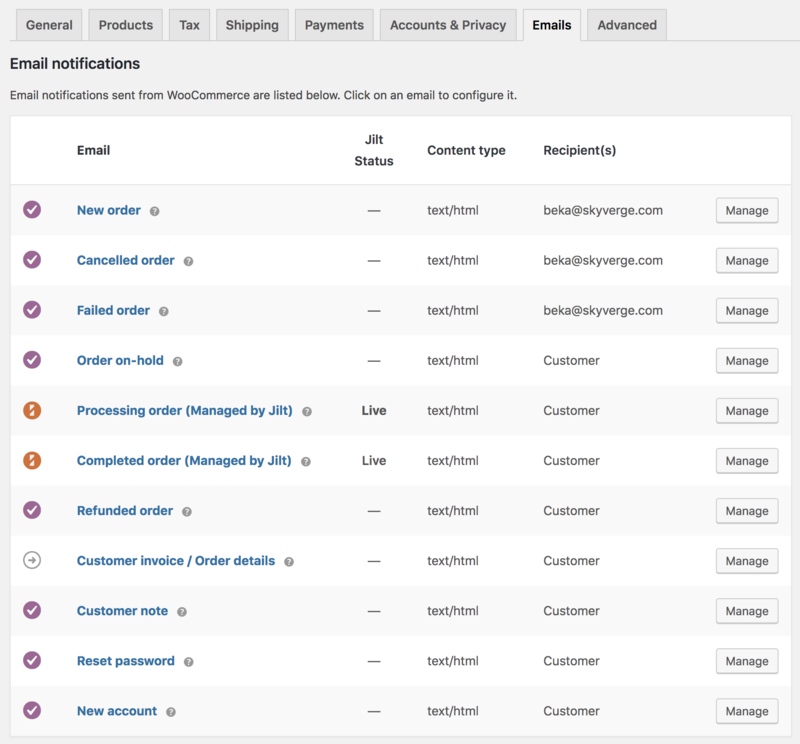 We do send Shopify order receipts with a slight (1-2 minute) delay so customers don't get too many emails at once. For transactional emails that aren't order notifications, there's nothing you need to do! Ready for Transaction Emails with Jilt? You are now all set to send transactional emails with Jilt, including the ability to fully customize your messaging and template. Check out our instructions for adding default and alternative notifications here. You can get started in the dashboard, or if you don't have a premium Jilt account yet, you can start one. Congrats! We hope you love it.